David Suchet delivers a comic tour de force as a silver-tongued 90-year-old furniture dealer in Arthur Miller’s "masterpiece" (Daily Telegraph), The Price. Two brothers, Victor and Walter Franz, one a New York cop nearing retirement, the other a successful surgeon meet for the first time in 16 years to sell their family furniture stored in the attic of a condemned New York brownstone. Revelation follows stunning revelation as each brother realises the price they have paid for heart breaking decisions made decades earlier. David Suchet, revisiting the work of Arthur Miller after his legendary award-winning performance in All My Sons, plays Gregory Solomon. He is joined by Brendan Coyle (Mr Bates in Downton Abbey), Adrian Lukis and Sara Stewart who plays Esther Franz, Victor’s wife. 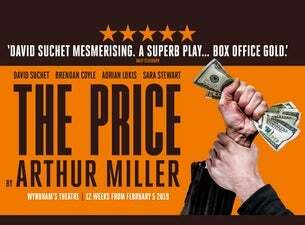 This 50th anniversary production of Arthur Miller’s richly affecting play – which, like his better known works, mines his preoccupation with the pleasures and perils of the American Dream - transfers from a sell-out run at the Theatre Royal Bath where it was hugely acclaimed by critics and audiences alike.